Nowdays lots of people are putting up antennas to either beam in different directions at the same time or just to stack them and get a lower angle of radiation. In both cases you need to somehow transform the two 50 ohm antennas so you still get 50 ohm output/input to the radio when you have them both connected. I have made a couple of these boxes and they are very simple to make. Some people simply just make stacking cables but I prefer using a UN-UN transformer since it works on several bands and takes much much less space. 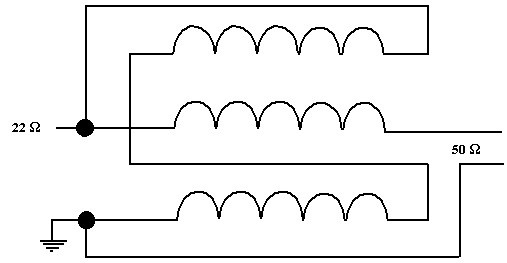 A stacking system that is made this way is simply a aproximation of a two way stack and three way. The UN-UN transformer has got a ratio of 2.25:1 and that way you will get about 56 ohm with two 50 ohm antennas connected and 37.6 ohm with three antennas connected. That gives you a reasonable SWR in both cases. Picture 1. 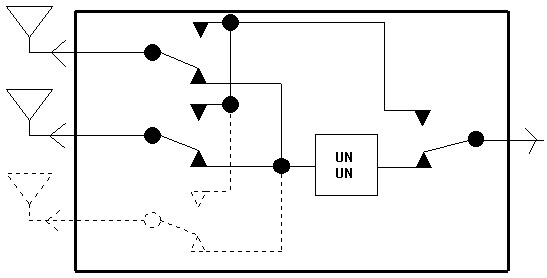 The idea of how a stackmatch works using a UN-UN transformer. First of all you will need to have a core to wind the transformer around. I used a FT-240-61 core but anything with 125 in permeability or less works just fine (ex. FT-240-61). Wind it five turns trifilar around the core with copper emelded wire and connect the wires together as shown on the picture below. Picture 2. How to make the UN-UN transformer. Before you mount the UN-UN transformer into a box you should test it out with some kind of dummyload. It is best if you have an antenna analyzer or network analyzer but it works to test it with a Tranceiver aswell. Just make sure to use a dummyload that handles the power if the later option is chosen. I used a network analyzer at school and just a few resistors when testing it.